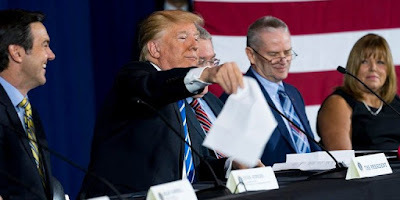 WHITE SULPHUR SPRINGS, W.Va. — President Trump on Thursday lashed out at Democrats for opposing his proposals to fortify the border and toughen immigration laws, accusing his political opponents of embracing dangerous policies to secure immigrant votes. Mr. Trump traveled to West Virginia on Thursday to promote his $1.5 trillion tax overhaul before a friendly audience. But the president grew bored with his prepared remarks after a few moments and returned to the bitter complaints about the nation’s immigration laws that have dominated his attention this week and prompted him on Wednesday to ask governors to deploy the National Guard to the southern border. Mr. Trump opted instead for a lengthy tirade against immigrants and the nation’s immigration laws, including a practice known as “catch and release” in which migrants who present themselves at the border are released from custody to await an immigration hearing to determine whether they should be allowed to remain in the United States. Mr. Trump also said his administration had cracked down on MS-13, the transnational gang with ties to El Salvador, detailing its brutal methods. “This is the kind of stuff and crap that we’re allowing into our country, and we can’t do it,” Mr. Trump said. He also repeated his false claim that millions of people voted illegally in the 2016 election. Mr. Trump’s remarks drew enthusiastic applause from an audience of about 200 in a state that he won with 68 percent of the vote, his largest margin of victory in the country. But it also drew rebukes. The round table on taxes was a lovefest for the president, in which attendees took turns praising him and recounting the ways in which the tax measure and Mr. Trump’s agenda had helped them and their families. “This is a big deal for our family,” Jessica Hodge said, choking back tears after her husband told Mr. Trump that their family had saved $2,417 because of the tax cut. He said they planned to spend it on a kitchen renovation. “Thank you for listening to us. Thank you for fighting for us,” she added. The president grinned and nodded his approval. Evan Jenkins, a West Virginia House member, and Patrick Morrisey, the state’s attorney general — who are competing in a May primary to run for the Senate — flanked Mr. Trump and took turns showering him with praise. As he wrapped up the event, Mr. Trump asked the audience to weigh in on which man should win the primary next month. The applause were loudest for Mr. Jenkins, who represents the district that White Sulphur Springs is in.